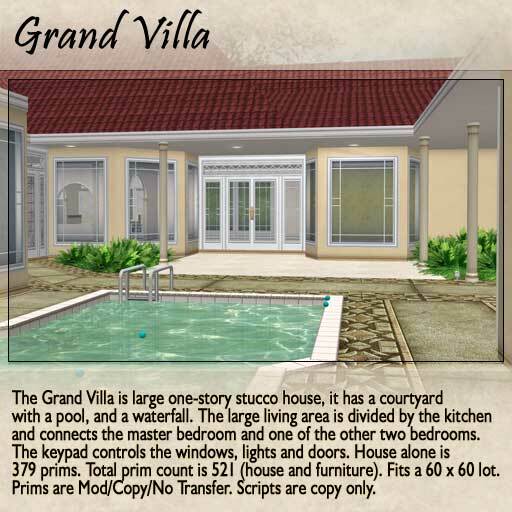 The Grand Villa is a large one-story stucco house, it has a courtyard with a pool, and a waterfall. The large living area is divided by the kitchen and connects the master bedroom and one of the other two bedrooms. Each one of the 3 bedrooms have its own private bathroom. The keypad controls the windows, lights and doors. Windows have 3 levels of privacy: clear, medium and one way opaque — you can see outside, but they can’t see inside. The kitchen sink, tub, sink and shower all have running water. The bathroom mirror can be clicked to turn on the light. The house fits a 60 x 60 lot. 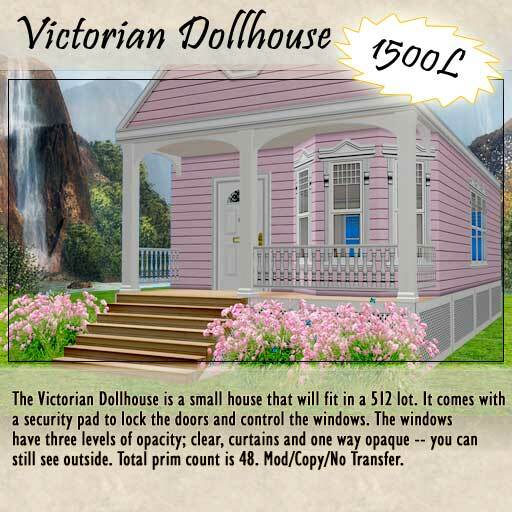 House alone is 379 prims. 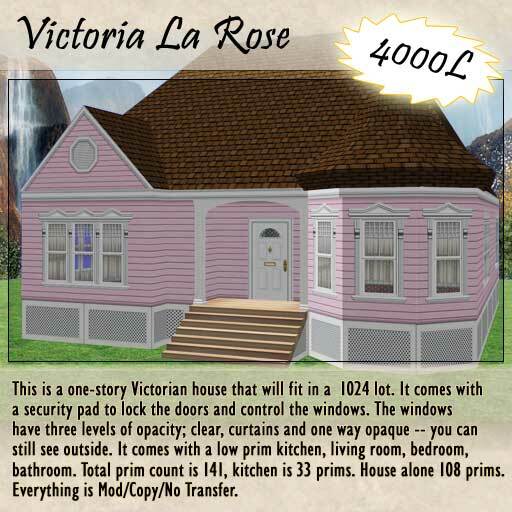 Total prim count is 521 (house plus kitchen and one set of bathroom fixtures). Prims are Mod/Copy/No Transfer. Scripts are copy only. Victorian style house that will fit in a 1024 lot. Includes kitchen! 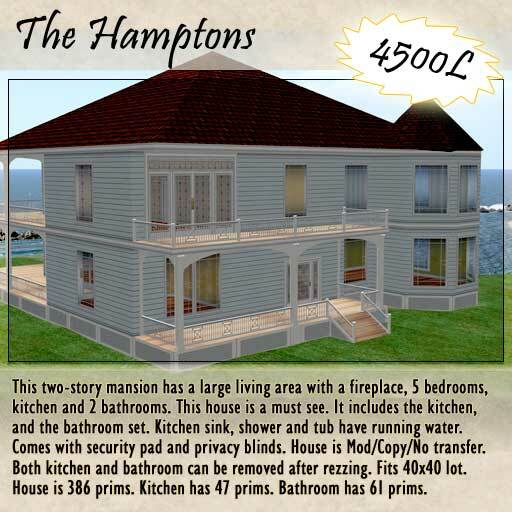 The house alone is 108 prims, 141 with the kitchen. Copy/Mod/No transfer. This pretty little thing fits in a 512 lot and it’s only 48 prims. Copy/Mod/No transfer. 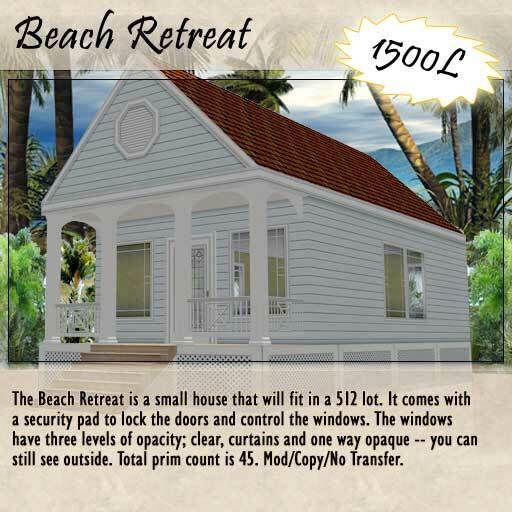 The Beach Retreat is a small house based on The Hamptons that will fit in a 512 lot. It has a security pad to lock the doors and control the windows. 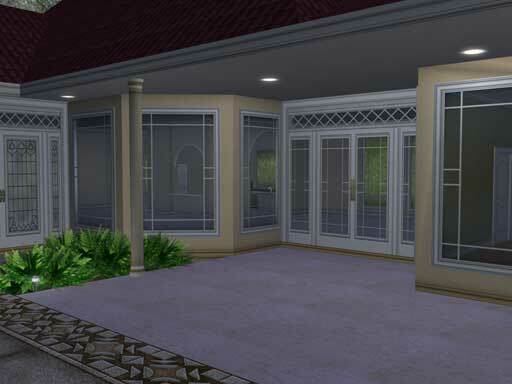 The windows have three levels of opacity; clear, curtains and one way opaque — you can still see outside. Total prim count is 45. Mod/Copy/No Transfer. This two-story mansion has a large living area with a fireplace, 5 bedrooms, kitchen and 2 bathrooms. This house is a must see. It includes the kitchen, and the bathroom set. Kitchen sink, shower and tub have running water. Comes with security pad and privacy blinds. House is Mod/Copy/No transfer. Both kitchen and bathroom can be removed after rezzing. Fits 40×40 lot. House is 386 prims. Kitchen has 47 prims. Bathroom has 61 prims.